The CKSURG Bullseye Survival Knife from Smith & Wesson is essential to any gear kit, whether on a recreational hike or on the job. The 8.66 inch blade is crafted from hardened 440C stainless steel and coated with titanium for added resistance to corrosive materials. This full tang, tanto style point maximizes the blade's toughness while providing impressive strength at the tip and stability when cutting through hard surfaces. The Bullseye features a G10 handle with textured grip for a comfortable feel and secure hold. 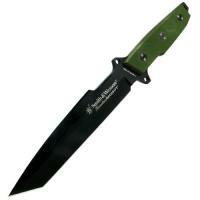 A ballistic nylon sheath is included for safe transport and protection of the blade. Additionally, the convenience of a sharpening stone completes the package.